Doc Weather is constantly looking for ways to illustrate the relationships between the motions of the planets and the movements of weather systems. Since weather is about systems in flow, the branch of physics called chaos theory is a place to look for connections. Chaos theory studies systems that are flowing. The keywords for chaos studies are sensitive dependence, especially in the realm of time, and the onset of unpredictable states within a system that is undergoing gradual change. 2 effect the system in an accumlative way, gradually amplifying through time. As a result, systems that are flowing have a quality about them that resembles memory in organisms. Things keep repeating rhythmically but when they repeat there are subtle changes. This means that in systems that are in flux, parts have a subtle linkage to the whole. The linkages are revealed through time, so in dynamic systems time is a key element to observe. The following essay is an attempt to link the time imagery of the Standard Map in physics to the potential for modeling climate changes based on the time increments of planetary motion. In physics it is understood that the vortexial or circular motion of air in a weather system is the result of two movements set at ninety degrees to each other. The reference to ninety degrees is the 90° of arc of a circle. The two movements are set at 90° because that is the motion in a wave. In a wave one motion is in the vertical plane, this is the amplitude. There is also the motion of the wave in the horizontal plane, this is the frequency. The 90° placement is depicted in image 1 as the diagram on the left. However, the circular or vortexial motion in a weather phenomenon is really a wave moving around one point. To imagine this just slide the lower curve and the upper curve of the wave on the left until they are on top of each other and you get the circular diagram on the right. The rotation of the vortexial wave has a particular frequency and amplitude relationship that is in a specific harmonic range. 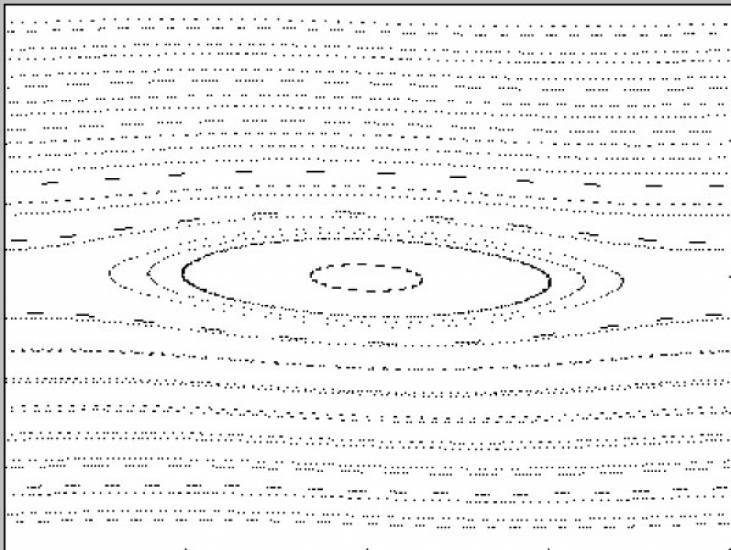 That harmonic range is related to the dimensions of the vortex. Any outside force changing this rate of motion causes deep changes in all parts of the vortex because the parts are harmonic to the whole. In reality, the vortex oscillates between two states or phases of motion as it spins. In effect, the vortex is trying to keep the forces in balance. To understand this, lets think of the wheel of a car rotating as it goes down the road. If the tire is balanced by a technician by putting little weights on the side, then the rotation of the wheel is harmonious. If the tire technician puts the wrong weights on the tire then the wheel is considered out of balance. What will happen when the unbalanced wheel is rotating down the road is that at a certain speed, the small incremental additions of the weight plus the motion of the car accelerating at a certain rate will cause a vibration to occur that will spread throughout the whole car. This is because the rotation of the tire has a specific frequency at which it is harmonic but the uneven weight forces the tire into another phase or frequency when the car accelerates enough to start the vibration. If the driver slows down or speeds up the dissonant or chaotic forcing stops. When the tire is shaking, the movements of the whole system of the tire and the car are moving together into a chaos state due to what is known as the forcing of the rotating wheel. The forcing happens when some outside force is applied to the wheel to move it from its steady state. In this case the weight is one of the extra forces that pushes the system out of its harmonic parameters. The other is the acceleration of the car. Such a small weight does not immediately cause significant chaos at low speeds, but over time as the increments of the speed plus the weight are fed back into the system the gradual feedback of the added weight plus speed, forces the system beyond its harmonic parameters until chaos arises. In the language of physics this is an example of what is known as a feedback circuit. A small difference in amplitude of force when repeated over time is fed back into the system and increases the forces in the whole system until the forces reach a resonant level that overloads the integrity of the system and a new phase of balance needs to be established. In chaos theory, a small repetitive input of energy eventually causes turbulence through the entire system if it is repeated again and again at regular intervals. The repetition of such a small force in precise repetitions is known as forcing. The mathematical technique used to model forcing is known as iteration. In physics there is a mathematical iterating technique for studying such forced systems. It is called the Standard Map. In physics the word "map" refers to the practice of repeating or iterating a pair of equations or algorithms many times to watch what happens when the product of the output of one iteration is added to the input of the next iteration. These effects tend to give harmonic pictures that can be plotted and then used to study the qualities of the dynamics in the entire system. As a result, the sequences of iterations is called a map. The map depicts what physicists call a phase space. It is a theoretical space that responds to the fluxing of inputs and outputs in measureable ways. The phase space is the space described by the relationships to the phases of the energies depicted in the map. One such map is known to physcists as the kicked rotor. A rotor is a theoretical point moving in a fixed orbit around a central point. As the point moves in orbit it is "kicked" at a specific time with a specific force so that its energy doesn't wind down and bring the activity of the system to a standstill. The kick on the rotor point is exactly the same force each time and comes at exactly the same intervals in time, each time. It is like the push a person gives to a child on a swing in order to keep them moving. It is the same push each time and happens in the same time frame each time. The push is the kick to the rotary motion of the child on the swing. However, over time the kick to the rotor will change the motion of the point moving in orbit depending on where the kick happens in the trajectory of the point. The point either speeds up or slows down depending on where it happens to be at the moment the kick arrives. Even though the intensity of the kick is always the same, and it always comes from the same direction in space, and is always in the same time increment, the amount of the kick that actually influences the motion of the point as it moves in orbit depends on the position of the point in the orbit at the instant of the kick. A kick right before the point gets to the kicking point, adds no new energies to the system. A kick when the point is just at the kicking point is very energetic in the system. There is a wide range of constantly shifting relationships between the point and the kick. The full spectrum of their possibilities is described with the iterations in the map. The problem of the kicked rotor is a classic in physics. You can either measure where the point is in its orbit or how fast it is moving, but not both. You can tell how fast a point is moving in an orbit but then you can't tell where it is because it is still moving. Or you can tell exactly where it is but then you can't tell how fast it is moving because you have to stop it to measure where it is. The shifting relationship between these two parameters is the dynamical space that the map tries to depict. Physicists call such a dynamical space a phase space. This is because the motion and position of the point is constantly changing phases in its energy spectrum as the kicks hit it in different ways. The iterations of the map try to describe the movements of the whole system by putting the product of the output of the last iteration as the input of the next iteration. The Standard Map is the most simple and fundamental example of what happens when you do this. That is why it is the standard for mapping. Similar to the example of the weighted wheel reaching a state of chaos at a certain speed, low speeds of the orbiting point in the Standard Map do not tend to produce chaos. There is no chaos when the kick strength is set to a low value. At higher kick values the energies in the system are forced to find different relationships. To study these relationships the strengths of the kicks can be controlled graphically with computer modeling. Then, the morphing of the forms of the maps can be graphically modeled in a computer. The effect of different driving strengths on the point can then be plotted into images and studied. The following set of images depict the effects of a gradually increasing kick strength on an orbiting point. In these images the phase space around the rotor is shown to be changed by the different energies of the kick. Forms arise in the space in response to the different phase relationships. The images are adapted from computer maps available on the internet. These transformations of the computer modeled phase space will then be used to build a model that asks some questions about climate systems and planetary motion. In the first figure a Standard Map is illustrated that is forced by a weak (.1) kick. Every time that the point comes back to the kicking place, the exact same degree of kick is given and the point establishes a position / velocity relationship that is mapped by equations. The diagram with the low level forcing shows a system in balance. The point is orbiting on the inner line. The forms around the space are built of points that arise through the iteration process. These points will form eddies and currents around the rotating point as the series progresses. The original diagrams are mathematically precise. These adaptions are not but can serve to illustrate the idea. In the next image(.3 driving force) the kick to the rotor has been enhanced slightly. We can immediately see that the space around the circuit has been warped or stressed by the enhanced kick force. The stressed streamlines in the surrounding space are elongated and terminate in sharper points that show the potential for pinching off. The larger, more remote streamlines around the whole form show a reciprocating type of form principle. That is, in this form, a set of contracting points on opposite sides (points on right and left) is recriprocated by a set of expansive curves opposite each other (above and below). These sets of points are found at 90° to each other. The whole form is an image of streamlines under stress. The left hand point is curving downward, the right hand point is curving upward and the whole space around the expanded sides is interacting with these motions. The next image(.5 driving force), shows the further evolution of the space around the driven rotor. 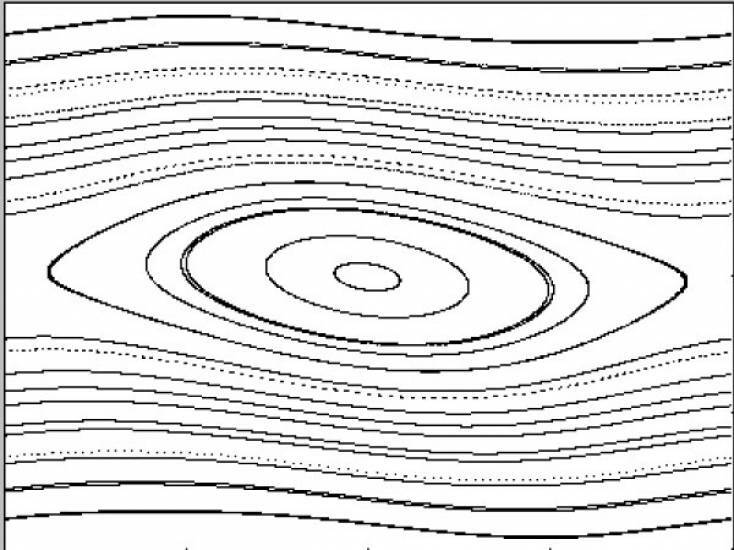 Lacunae or hollows form in the stress streamlines in response to the stronger input of the forced rotor. There is no chaos in the system yet, meaning that there is no breakout of independent vortexial trains. But there is a potential for chaos as the whole space responds to the increased forcing in the stressing of the streamlines. If this were a picture of a flow of air, such as we would find in a climate scenario, with the winds circulating around the Earth, the lacunae would be seeds for vortices that would be balancing the flow of the circulation around a central vortex. At this level of input we can see that the whole system is responding to the enhanced kick of the rotor. It is interesting to note that the peripheral areas of the system show the most significant stress reponse to the forcing. We might expect that the area closest to the rotor would show the strongest response but from the map it does not appear to be the case. The peripheral areas show significant sensitivity in a forced system. This illustrates the linked or harmonic relationship between the central forces of the map and the peripheral forces of the map. We will return to this reciprocal linking later when we shift from microscale theoretical phenomena to macroscale global phenomena using the Standard Map as the model. In image 6, (.7 driving force ) the rotor is approaching a statistically and experimentally significant limit. In chaos modeling the level near to .7 is a common threshold for the sudden onset of chaos from what had been a gradual enhancement of forces in an evolving flow system. 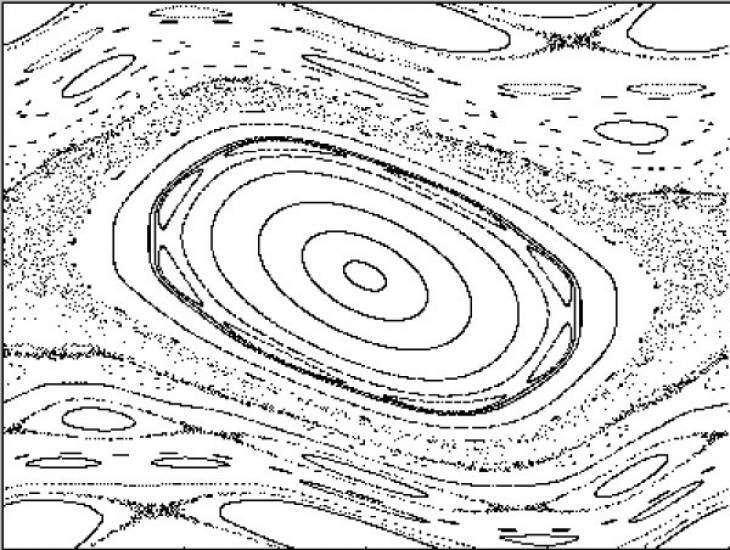 In this image, the elongated stress streamlines themselves are breaking down into potentially chaotic votexial patterning. The tips of the previously pointed areas are dissolving into vortices. Areas of turbulence are sprouting spontaneously all over the periphery. Statistically, many experiments in chaos theory have identified this level of forcing as a defining stage where chaos starts consuming the prior ordered relationships between the streamlines. 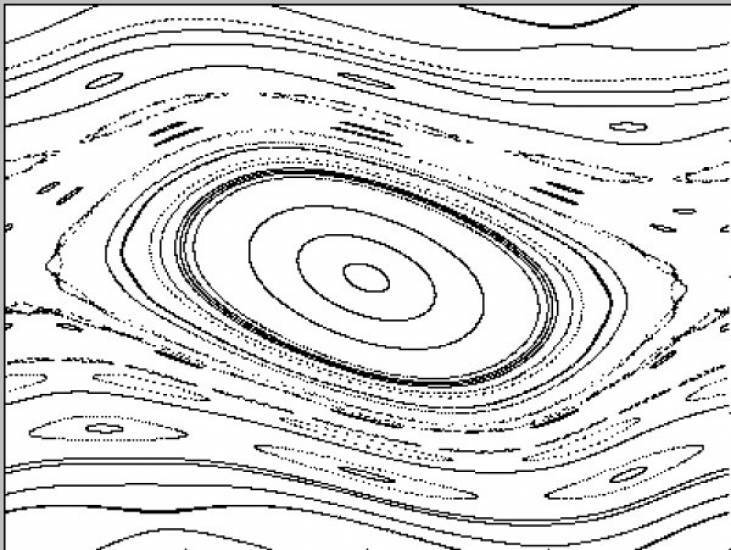 The driving force has generated a response in the whole field that threatens the integrity of all of the relationships except for the central set of rounded streamlines. The streamlines in that area are beginning to return to a form that appears less stressed. The next image shows that the enhancement of even a small degree of driving force in the kick level, has pushed the whole field into a broad chaotic pattern of vortexial motion (.71 driving force). The pointed areas of the stressed streamlines have broken down further and small cells of new vortices are forming in the middle periphery. 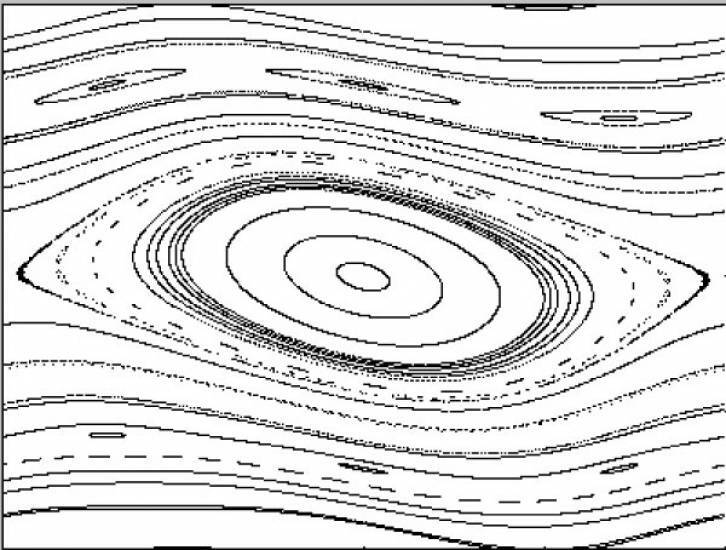 In this image the slightly enhanced driving force of the rotor has pushed the Standard Map into a strong emergent chaos. The slight additional degree of force in the kicking motion has to be worked out in the system. The forms that reveal this are the rash of new potential chaos points within the streamlines near the center. Seeds for vortices are sprouting in the zones between the periphery and the central orbit. 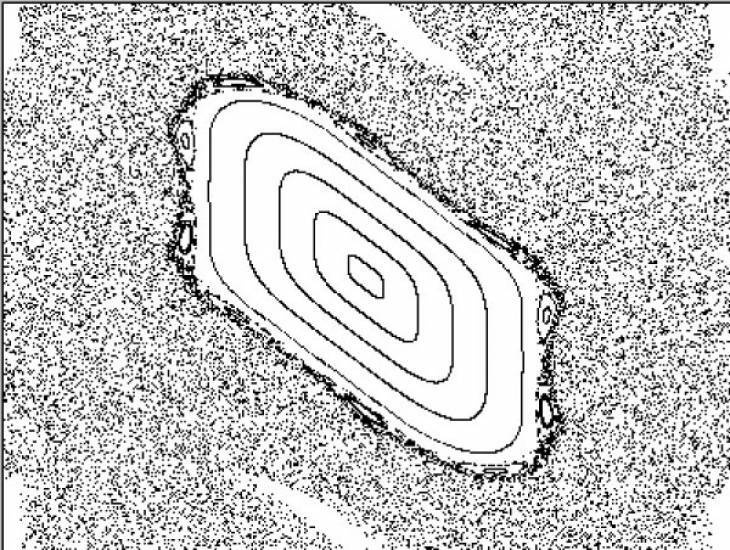 The emergence of a gray band of points along the lower border of the form points in the future direction of the whole form. In figure 8 (.73 driving force) the chaos has bloomed into the formation of a dominating middle gray band of innumerable seed points for future vortices. The grey areas around the central streamlines are clouds of smaller seed points that are arising within the whole field to deal with the enhanced input of kicking energies. 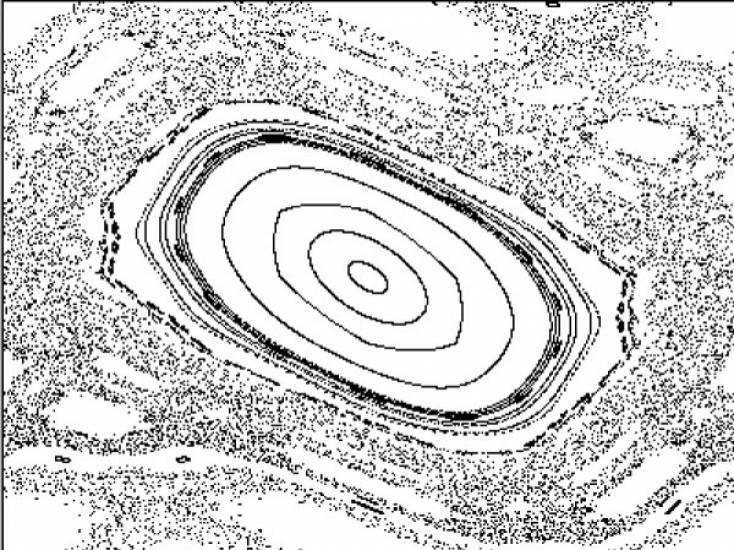 In image 4 the stretching linear motif of the initial polarities of pointed and rounded areas of the large inner form has, in image 8, dissolved into a gray band composed of the seed points for new vortices. At this level there is the onset of greatly enhanced vortexial potentials. Vortexial potential is a climate term that describes situations where there is a sudden emergence of many storms in a short time period. The storms emerge suddenly from conditions that appear to only change to a slight degree. The energy enhancement of storms when a period of vortexial potential is heightened is very unpredictable. Storms seem to appear from nowhere and are quickly followed by another storm. The sudden appearance of vortexial potential is one of the great unsolved mysteries of weather science. 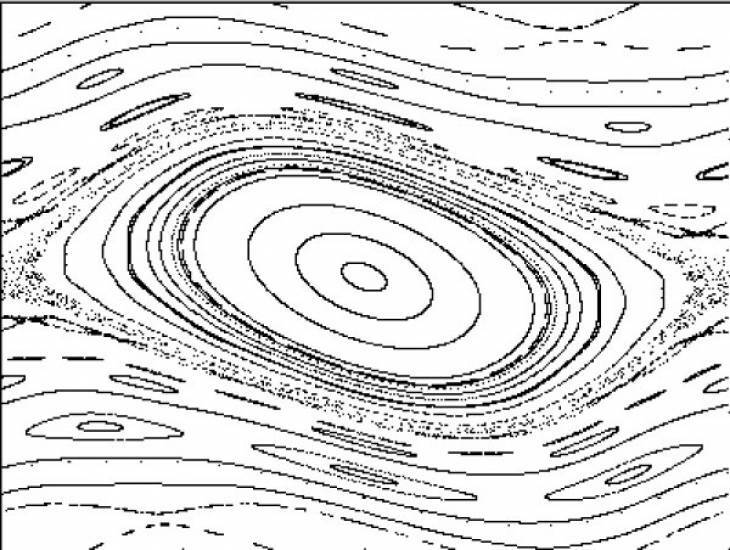 In the figure 9 (.9 driving force) the gray band of potential vortex points has spread and the zone around the original stressed streamlines of the early stages is now the site of new cells of vortices. Around these enlarging cells the original stressed streamline of the pointed / expansive polarity has become a diffuse cloud of vortex points. Outside of that the peripheral field is opening up to whole families of vortices large and small. 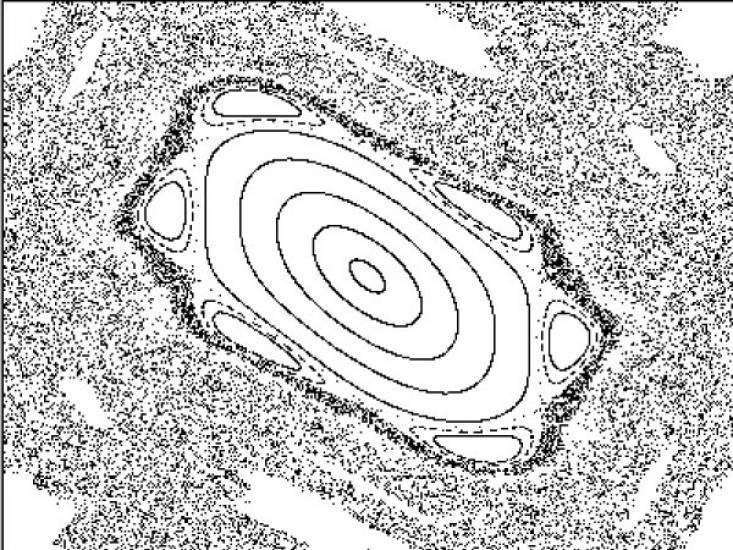 In image 10 the attenuated form of the original stressed streamline has dissolved completely and a cloud of points is forming general zones as the central area becomes active. This area is now the site of a group of bands of new vortexial forms. The rhythm of these new forms makes them appear like a set of pearls on a string. The whole system has achieved a new formal motif. In image 11 the doubling of the force of the kick has brought a new level of organization. The doubling of the kick energy has created a whole system of harmonically spaced vortices around the original streamline of the early stages, as the system further seeks to balance out the enhanced input of energies. This central area is embedded in a large mass of points and surrounded by a dense border of points. A new level of stability has been reached. But now the center is showing the signature of a new stressing as it, once again, subtly begins to elongate. In image 12 the enhanced kick energy has set into motion another stressing of the system. A comparison between the inner streamlines of image 10 and image 11 will reveal that the harmonious rotor streamlines in image 10 are showing signs of stress in image 11 even as the vortices arise on the periphery of the new form. Comparing image 11 and image 12 shows an enhancement of this stressed quality. The whole system is off in a new direction seeking its harmonic balance even as the energy level is being enhanced to force it into a new phase. It should be emphasized that the differences seen between the forms in this series, are based on keeping the degree of force in the kicking motion for each level constant and also keeping the time of the kick constant. The degree of force of the kick of the rotor sends a particular quality of energy into the whole system. When this energetic movement quality is iterated through the computer model the system is forced to shift to a different phase of its functioning to incorporate the incremental energetic additions. This results in the different forms in each picture. It is the quality of this kick motion iterated (in time) into the phase space that is the determining factor in modeling the behavior of the system. This is according to the phase space parameters of the Standard Map of physics, the most fundamental image of dynamic systems. Let's imagine now that this map was describing a physical dynamic system of weather forces instead of the Standard Map of abstract forces. If that was the case, the image of the spaces surrounding a kicked rotor could represent the motion of the vortices of rising warm air surrounding the central column of rotating warm air in a hurricane. This is seen in image 13. Each globule in this image is actually a column of rotating air. 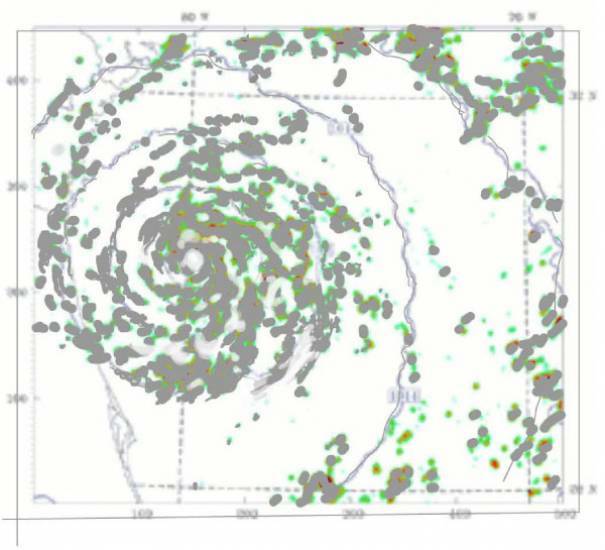 These smaller vortexial columns rotate around a central eyewall of driven winds. The image resembles the Standard Map in many ways. On a still larger scale the Standard Map could also represent a large circulation of smaller mesoscale fronts around the Aleutian Low that is thousands of miles in diameter. The image for each of these phenomena could be the same Standard Map. The only difference is the scale of the phenomena themselves and the fact that they are actually physical systems instead of a theoretical map. The correspondence between the Standard Map and weather was part of chaos theory right from the beginning since the early researches into chaos were done by meteorologists. Pushing the scale of the Standard Map even larger, imagine that the circuit of the kicked rotor is the orbit of the moon. 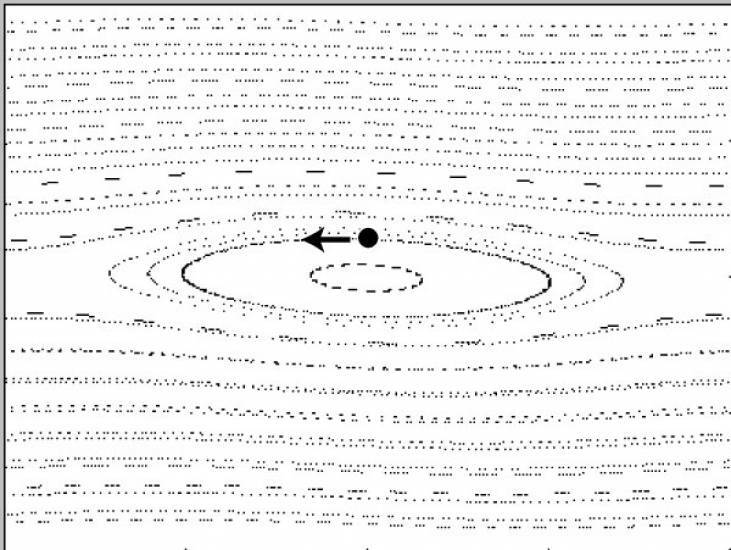 Then, according to the physics of the map, the changes in orbital force patterns would perturb the phase space of the whole system in which the kicked rotor was moving. If the model holds true on all scales then could we expect that a moving planet going through phase shifts with regards to the shifting values of position and velocity would generate vortexial potentials in the phase space of the field? 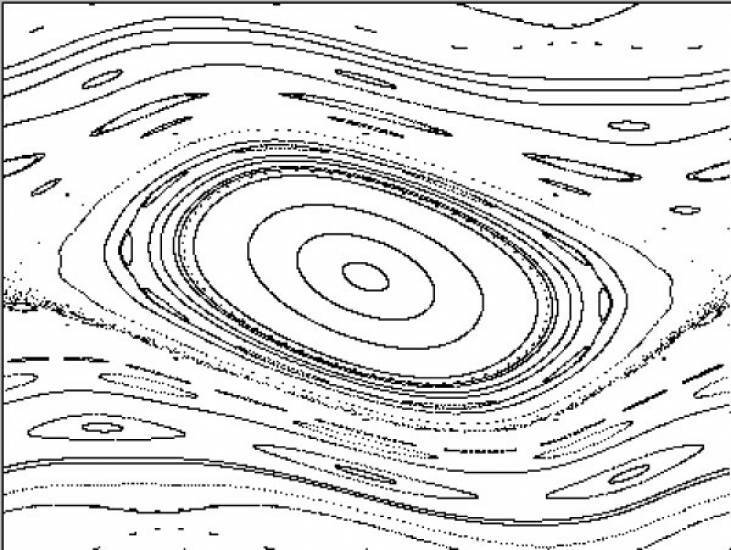 Would a stronger degree of forcing on the rotor of the orbiting planet create more complex vortexial patterns and instigate periods of vortexial potential similar to the onset of chaos in the Standard Map? 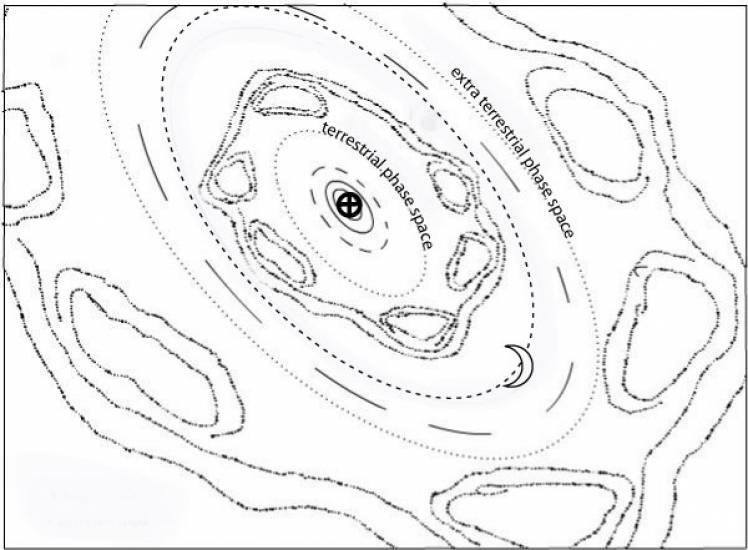 In figure 14 (moon orbit as rotor) we have blended the image of the Standard Map in figure 11 with an image of the moon as rotor. 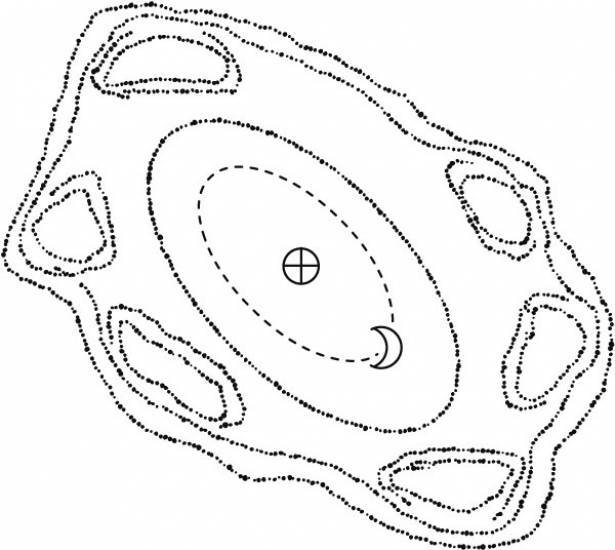 The lacunae then are vortexial seed points outside of the orbit of the moon as they are shown on the Standard Map. In this context we can return to the earlier question of reciprocal linking between the central and peripheral zones of the map. If the driven rotor of the lunar orbit would perturb the phase space peripheral to its orbit would it also perturb the phase space within the orbit as well? In figure 15 we have added to the previous image a vortexial area inside of the orbit of the moon. The lacunae now illustrate the possibility of the formation of vortex trains on either side of the lunar rotor. Would the perturbations of vortex trains on the inside of the lunar orbit interact with the upper levels of the earth's atmosphere? Would the vortex trains on the inside of the orbit be harmonic to any movements of vortices on the outside of the orbit? What if the position of the rotor when it was kicked was taken as a geometric function of the whole field of the phase space? Would it be possible to draw lines across the phase space that could be used to determine the most likely place for an atmospheric vortexial emergence to happen? 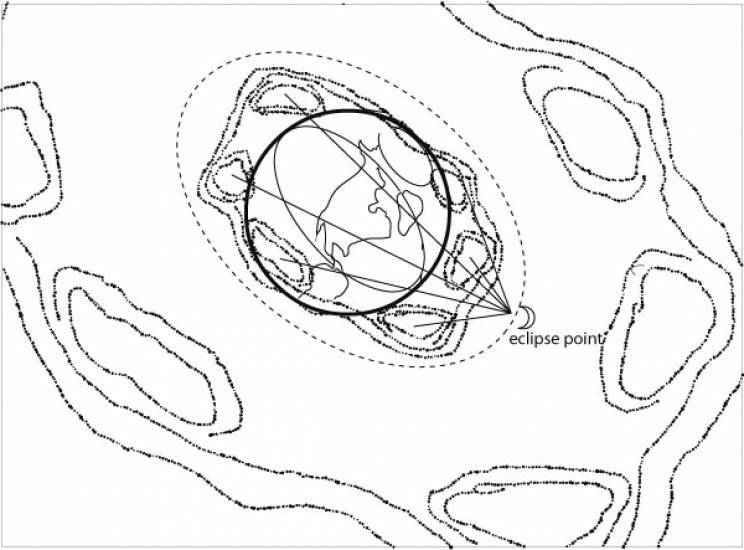 In figure 16 a sample field of lines is drawn out from the lunar eclipse position as the kick point. The lines then ray out across the phase space to link all vortexial potentials into a harmonic grid. The earth, depicted as a dark circle is imbedded in the lunar phase space in the diagram. What would happen on earth when the moon transited these harmonic phase lines as it reached its kick point in its orbit every month? Would atmospheric vortices arise in geometrically significant areas that could be predicted based on the phase space geometry of the Standard Map? What if, instead of a single rotor of the Standard Map, the climate map included a situation where two rotors simultaneously kicked in on the same day. Would this put additional force in the system? Would the climatic phase space then resemble some version of the lower level input in the Standard Map? What would happen if a series of rotors working in phase suddenly began to influence the phase space climatically. Would the climatic phase space react with a series of hurricanes, perhaps simultaneously arising in different areas that were actually harmonic to each other in time and space? What if two of the rotors had their kicking points set to be 90 degrees from each other and they reached their points on the same day? Would that shift the motion in a hurricane enough to move it up from a state two storm to a state five storm? What if the two simultaneously kicking rotors were opposite to each other and kept hitting the opposing points every two weeks for a month? Would this be a flooding event for a particular area? These types of rhythms can easily occur in the complexity of planetary motion events. Admittedly this line of reasoning tests some fundamental ideas of the Standard Map and requires a grain of salt. However, following this line of reasoning we could ask, when using the Standard Map as the model can the phase space at the planetary scale be geometrically linked to the smaller scale phase space of the atmosphere? Can the time frames of planetary motion be used to construct the time parameters of a phase map of the atmosphere? Would there be a time lag between them? Is there a linkage between position in the large scale and position in the smaller scale? Is there a linkage between velocity in the large scale and velocity in the smaller scale? If the Standard Map is truly the Standard Map applicable in all physical situations, then these questions may point to a new principle of research that would link physics, astronomy, and climatology in one science with the possibility for the inclusion of cosmology in the future.